We’re back for another episode of the University College! In an already-crowded Democratic field, the choices for the primary only keep increasing. We play a quick game of “First Word You Think” about the most noteworthy names in the field: Warren, Kamala, Bernie, Joe, Corey, etc. Also, do any of these candidates have a legitimate shot at the political throne, or is it too early to tell? There’s no doubt that the Jussie Smollet story has garnered quite a bit of attention? Do we think he’s telling the truth? It is certainly a strange story but listen to our discussion to hear our views on that, and the broader topic of why it can be difficult to express an opinion that is contrary to the “mob”. Finally, how many Nike executives contacted Duke, Coach K, and Zion when Zion’s shoe exploded in one of the biggest games of the year? Did Nike just lose the next “sure thing” before he even got to the league? As always, we love to hear your feedback, and thanks for listening. New year, new you? Not so much for POTUS. This week, we discuss the path from owning the shut down to blaming the Democrats for it--and more importantly the impact on the American people. Recently, it was announced that Michael Cohen, Trump's former fixer, is scheduled to testify in open session on February 7th. Will his testimony lead to any additional information or is this all for show? Lastly, we discuss the R. Kelly documentary and the rightful destruction of his legacy. Welcome back to University College! In this episode we take a look back at the 2018 midterm elections and discuss whether identity politics can still win elections for liberals. We take a look at why people vote for Trump, and the reason may actually be something far different than what you think. We finish up with a discussion about #Blessed and the freak that is Zion Williamson. As we count down to #PVHC2k18, we sit down with friend and Prairie View alumnus, Krystal Ashade. She has an amazing story that begins with a life-changing diagnosis at 12 and picks up with her authoring her first book titled "The Extraordinary Kashman." Kashman tells the story of a young child with Cerebral Palsy who is also a superhero. Even more touching, the story was inspired by Krystal's son. Equal parts touching, funny, and inspirational Krystal's book does a great job reminding us why everyone's story deserves to be told and that representation matters. We hope you'll join us for this very special episode. This week, the University College crew is back at it again! We discuss Trump's United Nations speech, much ado about Rosenstein, and is it ever ok to tell another man his wife/gal tastes like a breakfast cereal (a la the Carmelo incident a few years back). Welcome back to University College! We apologize for the late episode--life happens. In this episode, we talk about monkeying up things and the racist tones involved. We also discuss the importance of Nike's new 30th anniversary campaign involving Colin Kaepernick. We finish up with a look at the penultimate episode of Power! On the show this week, we discuss President Trump's SCOTUS nomination. What legacy is Trump trying to leave behind with his Supreme Court picks? We also take a quick look at Season 5 Episode 2 of "Power". Is Angela's character still useful? How many times can Tommy screw Ghost over? When will Season 1 Ghost return? What an amazing couple of days! Immigration is still a major news topic, Maxine Waters told a certain segment of America "they better shoot straight" and LeBron is headed to Tinsel Town. All of that is nothing compared to the return of Power! We look at all this and more in this week's University College Podcast. In this week's edition of University College, we take a look at adulting. A made up word, the trials, tribulations and triumph are too real for most of us. Is there a manual for how to adult properly? Further, what are the trademarks of being a successful adult? Is it owning a home, making and keeping friends, handling your money properly? For everyone, the proper version of being an adult means different things. 1) Is there any shame in living with your parents past your 30s? 2) Should you have an emergency fund? 3) Is it better to rent or own your vehicle/home? 4) Is making friends in your 30s as important as it was in your teens and 20s? We hope you'll join us for this interesting discussion. UC family, welcome back! Its been a while since we dropped a recording, but episode 69 is available! This week, we discuss the importance of Mother's Day and the uselessness of Father's Day. What did we think about Donald Glover's "This is America" video? Listen to find out. We also ask the question, can you be woke if you're dating outside of your race? This discussion then leads to a quick talk about what is "normal" versus what is "weird"? Do these labels even mean anything anymore. Listen and we'd love to hear your feedback. Things get a little chippy in this edition of University College. With the recent Cohen bombshell...is Special Counsel Robert Mueller barking up the wrong tree? Will Mike FINALLY admit that where there's smoke, there's the Trump administration in a dumpster fire? We also take a look at James Comey's new book, A Higher Loyalty: Truth, Lies, and Leadership. Was Comey doing the righteous thing and defending the integrity of the FBI, or was he feeding his own ego and grandstanding? We also look at the recent raid of Michael Cohen's legal office. Welcome back to University College! Recently, a discussion has re-ignited about how to join together the different parts of the African diaspora in America. Black Americans feel that their brothers and sisters from Africa judge them—while many first-generation Africans in America have the belief that Black Americans have squandered opportunities. In reality, we each have something to learn from one another and ultimately share the same cultural space. This week, we are joined by Dr. Nehdia Mumuni. Dr. Mumuni is a first generation American of Ghanaian descent. She talks to us about growing up in two cultures, and the differences she observed in Black Americans and her own culture. Think of this entire episode as a "from the archives," "cutting room floor-esque" recording. We talk about Trump and his inability to weather the Stormy, we discuss men who blame their wives for $30,000 doors, and wrinkles in time. 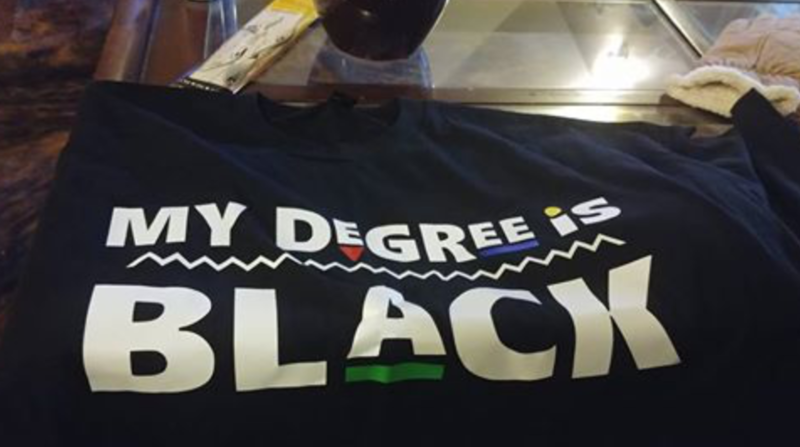 In this special episode, we sit down with Jamian Lattin-Simms and J. Albert Nicklos of My Degree is Black. We discuss their motivation behind the organization, and continue to further our discussions about how representation matter. #WakandaForever! You've undoubtedly seen this phrase all over social media due to the amazing success of the CBM "Black Panther". We take a look at the movie, the themes, the characters, the messages that the movie conveys to our youth, and why POSITIVE representation on screen is a good thing. There are a few plot details that we discuss so if you have not seen the film yet, go see it and then come back. As always, we welcome your feedback! Blacks and the GOP have a very unhealthy relationship with each other. The GOP generally has no problem telling minorities what they feel about them, and do not generally promote nor pass policies to help African Americans out. However, there was a time when the majority of African Americans that could vote chose to align with the Republican party--the so-called party of Lincoln. In this episode of University College, we briefly discuss the history of Blacks and the Republican party--as well as why it might be time to consider a switch from the Democratic party. We'd love to hear your feedback. Welcome back to University College! In this episode, we dissect the effectiveness of President Donald Trump's first State of the Union. The pomp, the circumstance, the red meat thrown out to his base, we look at everything. What did POTUS say--but more importantly, what did he leave out? What exactly happened with the government shutdown from a couple of days back? Mike, Curt, and I break it down. Let us know your thoughts about the new shortened show format as well! Reach out at universitycollege@yahoo.com, or @ucollege on Instagram, or @UnivCollegeBTC on Twitter. In this edition of the U.C., we take a look at "Fire and Fury: Inside the Trump White House" by Michael Wolff. Several allegations are made in the book--and regardless of whether they're true or not, the book is certainly entertaining. We take a look at some of the claims, discuss Trump's mental fitness and more.